Aspen Connect: iPad in the Panel! – EHFC Members Talking! The iPad has taken the aviation world by storm with a rich library of applications that preflight and plan a trip. This device was once tethered to a WiFi connection for meaningful weather updates or a cumbersome and expensive interface through Baron’s Connect and an XM subscription. There was no good option but to land and refresh your planning if the weather got dicey. Recently, with our new Stratus units, we can update weather in flight with both metar/taf textual information and radar feeds through the ADS-B system. This has enhanced safety as well as utility by bringing new data on board without a monthly XM subscription. As if all this is not enough, now Aspen Connect is becoming a reality with a two-way interconnect between your iPad and the Aspen in the panel. Imagine uploading the flight plan and frequencies you developed last night directly into the Aspen in your panel! No more twist/push time-consuming effort after start up…just select “send-to” on the iPad and export it to the Aspen. Similarly, after a flight you can export your flight data for analysis on the ground later. Aspen has developed this interface as an open architecture operating on many capable wireless protocols. The Connected Panel™ hardware is enclosed in a small box called the CG100 (patent-pending) that is blind-mounted behind the aircraft’s panel. This box contains wireless, Bluetooth™, and USB connectivity options — as well as flash memory storage. Leveraging commercially available technology, the CG100 includes standard protocol ports and communications slots that will allow developers to add peripheral hardware as needed to enhance the utility of their own applications. The world of your Aspen is about to change. Movies and angry birds while you fly? 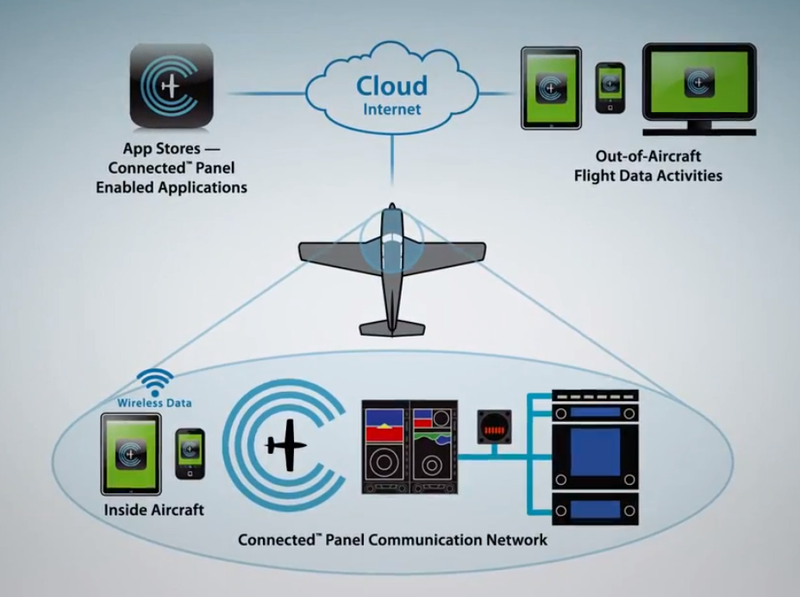 While we are on the subject, I will ask as I did several months ago; what is YOUR favorite APP on a mobile device…lets start a discussion and crowd source the best tools for pilots!